Concrete Tile Roofs In Dallas, TX - Repairs, Installations And Maintenance! Concrete tile roofs are a fantastic choice for homes in hot climates since they can help you save on your energy bills by reflecting UV rays. They also come in a plethora of styles and colors, with some even imitating other roofing materials, like clay tiles, but at a fraction of the cost. Also similar to clay tiles, this is a heavy material, so our roofers will need to first determine if your home can bear their weight. Concrete tiles have the added bonus of insulating your attic to stabilize the indoor temperature of your home even more. Eclat Roofing serves all needs for Dallas, TX concrete tile roofs! We can fix, maintain and replace your roof to help it last as long as possible. Call our roofing specialists today at (214) 373-1500! Whatever the damage, our roofing contractors are capable of fixing your concrete tile roof. If you have cracks in your tiles that are letting water and pests into your attic, let our roofers take care of the problem to secure your roof! A little roofing cement and extra tiles go a long way toward repairing your roof. We can install and replace Dallas, TX concrete tile roofs at competitive prices. Our experts will inspect your home to make sure it can bear the weight of concrete tiles. They can also help you determine what style, color and shape you want your tiles to be. Finally, they can install them with expertise that will help your roof last for years to come! Maintenance is an important part of extending the life of any residential roof. Especially if there has been a recent storm, it is always a good idea to let our roofing contractors take a look at your roof and make sure it did not sustain damage. Finding cracked tiles and other damage early during a roof inspection will save you more money later on. While the Dallas, TXDallas, TX area is our home base, we also serve the entire metroplex and beyond! 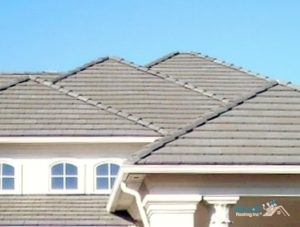 We can travel across the state of Texas and even do roofing projects in Louisiana and Oklahoma. Call our roofing contractors today at (214) 373-1500 for more information about Dallas, TX concrete tile roofs. Updated on September 13, 2018 at 3:04 pm by Eclat Roofing.